One of the strangest, most intriguing, and yet almost unknown episodes in American history unfolded in 1876, eleven years after the assassination of Abraham Lincoln. A band of Chicago counterfeiters hatched a plot to steal the President's body from its tomb outside Springfield, Illinois, and hold it for a ransom of $200,000. A paid informant told the newly formed Secret Service. When both the police and the criminals showed up at the cemetery on the appointed night, the scheme was foiled. This feature-length special from History explores the peculiar confluence of historical trends and cultural movements that prompted the crime: the birth of counterfeiting, the growth of embalming, and the influence of secret societies in American life, among others. But above all, the story shows how important this beloved President remained to a public so unprepared for his violent death in 1865. Startling and informative, this is one of those tales you have to see to believe. Sometimes truth really is stranger than fiction, and that’s true for the facts examined in Stealing Lincoln’s Body. In this program, we look at Lincoln’s assassination and its aftermath. From there we learn about the treatment of Lincoln’s corpse and his long funeral. Lincoln finally gets into his tomb in 1876, but he doesn’t stay there for long. A group of counterfeiters decides to snag Lincoln’s body for their own political purposes. The program examines their plot, its results, and connected events. Throughout the show, we hear from a mix of sources. We get notes from Lincoln President-Elect author Harold Holzer, Abraham Lincoln: A Life author Michael Burlingame, Museum of Funeral Customs director Jon Austin, Stealing Lincoln’s Body author Thomas Craughwell, The Lincoln Funeral Train author Scott Trostel, Abraham Lincoln Presidential Library curator James Cornelius, Lincoln Tomb site manager Nan Wynn, A Nation of Counterfeiters author Stephen Mihm, The Madness of Mary Lincoln author Jason Emerson, and Anything for a Vote author Joseph Cummins. A good documentary sheds light on a subject in a fresh way. Body doesn’t reinvent any wheels, though it does try to bring the president to “life” in an unusual manner. It presents some digitally manipulated photos that allow us to see Lincoln “move”. This technique seems more creepy than convincing, so I’m glad it doesn’t receive much screen time. Otherwise, Body goes with the standard mix of archival materials, historical reenactments, and “talking head” interviews. This doesn’t lend the program the most original feel, but it doesn’t need to impress us with flash. There’s a reason this format is so well-worn: it works. And the format serves the material just fine in Body. The show starts with an intriguing premise, one that most folks won’t know. I follow history but I can’t say I had any knowledge of the topic. The subject hasn’t remained obscure because it lacks excitement or drama. Indeed, Body follows a crazy plot chock full of strange events. The documentary conveys the story in a very good manner, as it brings out the weirdness of the whole along with the tension involved. I wouldn’t think a documentary about the theft of a corpse would manage to become so action-packed, but Body tells a funky tale in an involving manner. 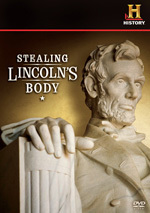 Stealing Lincoln’s Body appears in an aspect ratio of 1.78:1 on this single-sided, single-layered DVD; the image has NOT been enhanced for 16X9 televisions. Despite the lack of anamorphic enhancement, the transfer was acceptable. I thought the Dolby Stereo 2.0 soundtrack of Stealing Lincoln’s Body was also acceptable. The soundfield had little going for it. Music showed decent stereo imaging, and a few effects spread out across the front. These were minor, though, and didn’t add much to the experience. That said, a documentary like this didn’t need a dynamic soundscape, so I didn’t mind the bland presentation. If you want extras, you’ll find only disappointment. No supplements appear here. Stealing Lincoln’s Body may sound like the subject for some fictional “B”-movie, it actually gives us a fascinating documentary about actual events. The program follows the material well and keeps us engrossed. The DVD offers average picture and audio but lacks any supplements. History buffs should give this release a rental.